An intervalometer is a device which counts intervals of time. (Other names include interval meter and interval timer). Such devices commonly are used to signal, in accurate time intervals, the operation of some other device. For instance, an intervalometer might activate something every 30 seconds. With Magic Lantern, there is no need for an external device, we have an intervalometer built right in. You will find it in the Shoot menu. This is the core intervalometer function. Here you set the interval between pictures. 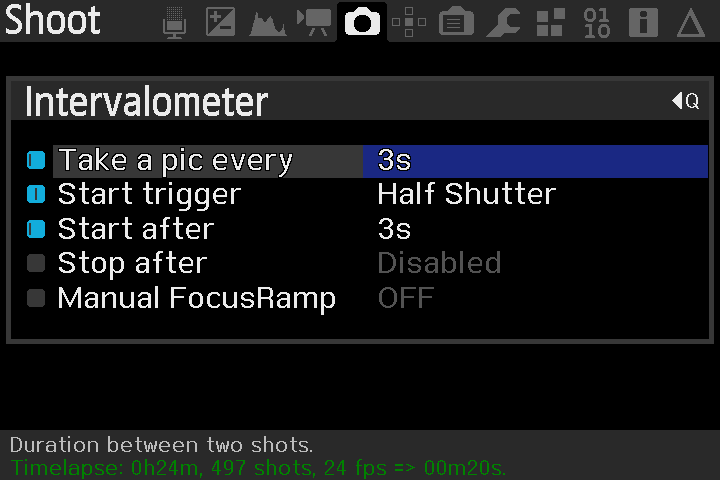 Note: The green text at the very bottom of the display shows how long the sequence will take to shoot, based on the Canon report of how many shots are left on the card, or based on the Stop after setting. It also shows how long the timelapse will display for at 24fps. Leave Menu: Start the intervalometer after leaving the Magic Lantern menu. Half Shutter: Start the intervalometer after half pressing the shutter button. Take a Pic: Start the intervalometer after taking a picture. Set a delay between the trigger action, and the actual starting of the intervalometer. How many pictures to take. Ramp the focus in steps per shot. The intervalometer times from itself. In other words, as soon as it triggers, the timer counts down from that trigger event. If you have some other processing being enabled, say AETTR, you need to make allowances for this processing, combined with your slowest shutter speed, to ensure the previous processing has been completed, before the intervalometer reaches the next trigger event. thnx for the tut.. waiting on the tut for "Don't click me"
hmm interval to ramp silence pics? i guess that would be a good plan "B" if exif info for silence pics is not doable. I'm looking to shoot a multi-day time-lapse and only record during the daytime (for plant growth). Any chance ML will ad a start/end time or even just a go for X hours then pause for X hours cycle duration? As written before: I cannot recommend to rely on ML (or any software at all) for long term use. Think about some device using a watchdog timer taking care things running as planned. ML may or maybe not take part in this operation. Mostly street photography, but other things too. 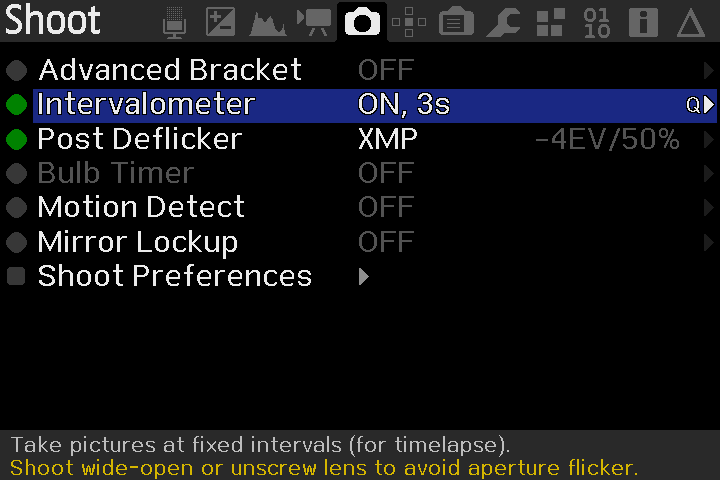 Is there a way to turn on autofocus while the intervalometer is running. I’d like to stick my camera at the end of a runway and have it track the models as they walk toward and away from my camera. Yes, there is (Shoot -> Shoot Preferences) but ATM the feature is buggy. See issue #2923.